Here’s a product that I wish I had seen earlier. The Trail Camera Guardian MAXX is an anti-theft device for your trail camera. It won’t protect your SD card from being swiped but it may very well save you from losing your camera. Let’s face it, trail cameras aren’t cheap and one bad apple can really cost you a lot of money, especially when you run as many Spartan cellular cameras as I do! For the trail camera enthusiast that buys high end cameras. the aluminum housing is 2.5X larger than the original Cam Guardian. It includes two security screws to lock down the wider stronger band. The band is heat treated high tensile and can withstand thousands of pounds of pressure. It is also coated to greatly resist rust. Protect your investment in a good trail camera with the best theft deterrent you can. The MAXX will clearly communicate to any would be thief that your camera is off limits. NO MORE STOLEN TRAIL CAMERAS – This Trail Camera Mount is the SOLUTION to your problem – Secure them with a Cam Guardian. This Guardian provides 48 inches of steel band to secure your cameras to a tree up to 15 inch diameter. QUICK AND EASY – USE ON ALL YOUR CAMERAS – Trail Cam Lock comes with One Uniquely Designed Key Tool and can work on multiple Cam-Guardians. Star shaped with unique center pin, preventing use with regular star wrench. STEEL IS HARDER TO CUT THAN PYTHON – Keep Honest People Honest – Make sure your Cameras will be there when you return. 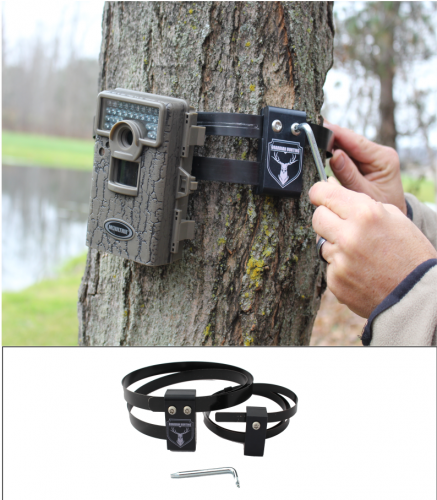 Cam Guardian will work as a Browning Trail Camera Tree Mount and SO MUCH easier to use than a Trail Camera Lock Box. NO BROKEN or FROZEN KEYS or multiple keys and codes for different cameras. SIMPLIFY your system and LOCK UP with Cam-Guardians.